From a backyard wedding to a gathering of thousands, Sound Garden Lighting Rigs set the essence of the event and when combined with quality audio, can take an event to a whole new level. Sound Garden lighting technicians are masters of lighting and at creating a mood with attitude! SG-Monogram Projectors illuminate a wall, floor or ceiling with a custom design that can be paired with your invitations and other wedding themed elements. Our custom designs and images add a stunning touch to your already elegant decor. Intelligent lighting can make a stunning impact on the energy of a wedding reception, corporate or stage event. Sound Garden Intelligent Lighting can be programmed specifically to your event starting from the formal introduction to the last dance. We can design a “Light Show” that will create an unbelievable experience of “Light and Sound”. Your event is transformed as the perimeter of the room subtlety changes to limitless colors or is enhanced by single color matching the room theme. Once the party gets going with non-stop dancing, wireless uplights move and chase with the music, adding more fun, extraordinary brilliance and energy to the party. Cool to the touch, the unique Sound Gardens Up lights are furnished with the Original GlowShields, designed by Sound Garden’s techs to give to give an elegant, clean, polished appearance to each fixture, as opposed to a fixture sitting on the floor. Event walls can be illuminated with color images to offset the room with color and add lighting texture to the venue. 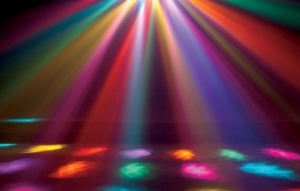 From a ceiling to a blank wall, color wash lights can illuminate an area of over 20’ square and are ideally suited for dances, and themed events. Accent spotlights are low heat, bright spotlights that can be adjusted to accent different parts of an event venue. Ideally suited for the cake table, signing book, gift tables but have been used to accent items at silent auctions and hard to see entrances. Like lit strings of pearls against a dark background, Tivoli lights can be used to accent poles around the edges of an event, plants, along the floor or draped into patterns from the ceiling, behind shear strands of translucent cloth – it is left to your imagination and creativity.